candidates can apply online on or before 19-07-2016 through online using the official website of BSSC @www.BSSC.bih.nic.in. This Drivers recruitment of BSSC will be conducted in three stages such as a common written test, Trade test and personal interview. Written Exam will be conducted in the month of September 2018. Exam syllabus us updated by BSSC for Driver jobs. Exam Syllabus pdf is attached below. For more details regarding BSSC Driver general recruitment exam please see the details given below. 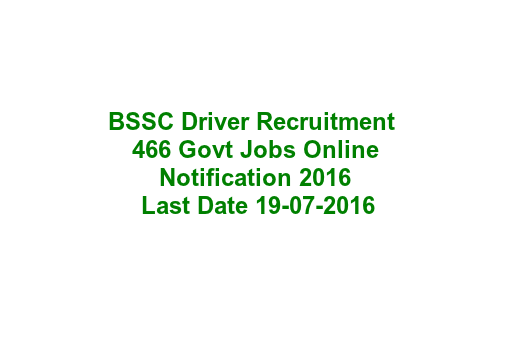 Click here to see the official notice of BIHAR SSC Driver Recruitment. Admit Card released date for BSSC Driver Exam-September 2018 1st Week. The candidate must have qualified 10th class and must have a Valid License of Heavy Motor Vehicle Licence. As on 07-January-2016 is 21-37 Years for general, for SC/ST 5 years of age relaxations are given and for OBC/BC/MBC candidates upper age limit is 40 years. Selection for this BSSC Driver recruitment will be held based on common objective type multiple choice written test, Trade/Driving and personal Interview. Those who qualified the written test they are called for the personal interview based on merit in written test and available posts ratio. For General/BC/MBC/SEBC candidates exam fee is Rs. 750/- for SC/ST candidates examination fee is Rs.200/-. The candidates have to pay this amount through the State Bank of India I collect before 21-07-2016. And keep receipt in a safe custody. In future whenever asked by BSSC you have to submit the same. Candidates can submit their application through the official website of www.BSSC.bih.nic.in online only. Before applying online read the user instructions and official notification. After completion of filling application online pay the application fees using SBI I collect an of the SBI branches. 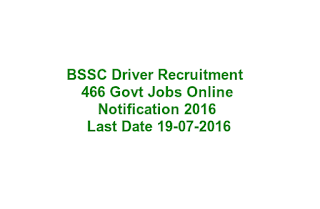 Click here to apply online for the BIHAR SSC Driver Recruitment 2016. Please share this BIHAR SSC Driver Recruitment 2016 article with your friends.